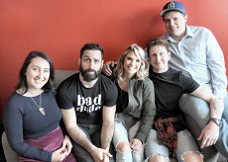 KBKS (106.1 KISS FM) Seattle has introduced the winners of "Seattle's Funniest Person Contest." Amber Cole (aka Alabama) and Evan Omelia (aka English Evan) join the "Carla Marie and Anthony Show," weekdays from 6-9:30am. In addition, the winner of the $10,000 refer-a-friend contest, the referral portion of the contest where listeners referred their top picks for the Funniest Person Contest for a chance to win a $10,000 grand prize, was also revealed. In November, 2018, Carla Marie and Anthony announced Seattle's Funniest Person Contest on 106.1 KISS FM. It allowed all eligible listeners a chance to compete for a chance to join the morning show by submitting a video of 60 seconds or less to the 106.1 KISS FM website. Each contest participant was tasked with putting together a funny short video, explaining why they deserved to win. In addition, the contest also offered a grand prize of $10,000 to a lucky listener who referred a friend. The winner of the $10,000 refer-a-friend contest was Mikaela from Bothell, WA. Alabama joins from WEBG-FM (Big 95.5) Chicago, where she most recently served as the Country outlet's midday host. In addition, she has also held several on-air posts, including air personality on the "Mason & Remy" show, afternoon host and midday talent for Big 95.5 and midday/afternoon host for WNOH Norfolk, VA. She began her career at WJIM-FM Lansing, VI. "Being a part of the legendary KISS brand has always been a dream of mine and living in the Pacific Northwest has been on my bucket list as I feel a true connection to the people," said Alabama. "I'm thrilled to be chosen to join the 'Carla Marie and Anthony' show and am truly lucky to be able to have fun with our listeners, advertisers and lively community each morning." English Evan previously worked for iHeartMedia Seattle as a Sales Account Executive and worked in security prior to joining the market. He is a graduate of Washington State University where he played two years of Division 1 golf. "It is surreal to be on air as a part of the 'Carla Marie and Anthony' show," said English Evan. "I've been a loyal listener of the legendary 106.1 KISS FM for as long as I have lived here and I can't wait to be a voice that helps wake up Seattle every morning." "This contest was all about attracting and finding the very best radio on-air personalities and providing them a platform to showcase their talent on-air," said iHeartMedia Pacific Northwest and 106.1 KISS FM PD Senior VP/Programming Tim Herbster. "After narrowing the field down from over 500 entries to our top seven, we knew it would be very difficult to pick just one winner and so we chose two. Both Alabama and English Evan have dynamic, relatable personalities that completely click with Carla Marie and Anthony. I'm thrilled to hear their instant chemistry on-air and look forward to the impact this show will have in our Seattle community."